The Schenectady Gazette of 1 December 1925 tells of the switch from ukuleles to saxophones, and of Mr Charles E King’s lament: Saxophones are making “the night hideous with their wails”. Mr King said that the old Hawaiian songs had melody and were sung with stringed instruments, notably the ukulele, but with the rise in popularity of the saxophone, people who don’t know either music or their instruments are picking their own way through a tune — sometimes two or three together, resulting in all noise and no music. Mr King believed that modern movies, dances and radio have killed the home-made quality music of Hawaii. Dear Madam — Will you kindly publish in your paper as soon as possible the answer to the following questions. 1. How can the costume of a Hawaiian dancer be made inexpensively? 2. How should the hair be arranged with this dress? 3. Could I carry my ukulele with such a costume to a masquerade party? 1. The skirt of the Hawaiian costume must be made to resemble streamers of grass or straw. To carry out this idea inexpensively you might use green or straw coloured cambric or cheesecloth cut into hundreds of narrow strips [Ed., straw is so expensive], which hang from the waist and form a skirt attached to the girdle. A pair of bloomers will have to be worn under the skirt. The waist is just a simple bodice and is mostly made without sleeves and with just straps over the shoulders, something in the style of the camisole [?]. Make this the shade of the skirt. Finish off the costume with a sash and with long yellow paper wreaths, which can be brought in any costume store. 2. The hair is worn hanging, the looser the better. It is decorated with lai, or Hawaiian garlands. 3. It will be very appropriate for you to carry your ukulele to the party and to play occasionally to keep things lively. I wonder how many people turned up in this get up, and how lively things got — all those ukuleles! 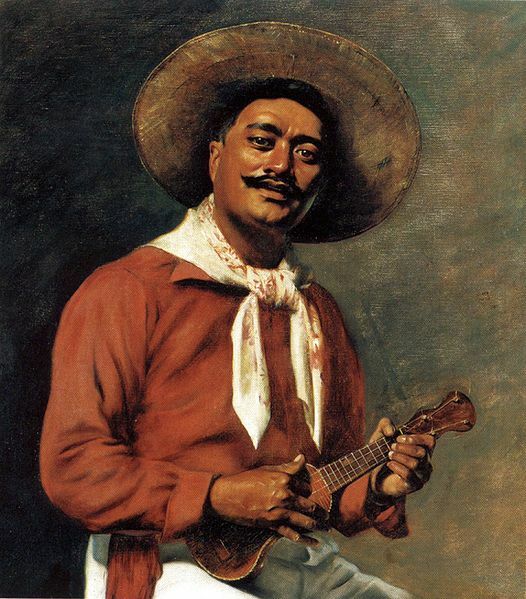 Hubert Vos [has painted] a Hawaiian of the present day dressed in red shirt and white trousers with a large handkerchief about his neck and a broad brimmed straw hat tilted back, exposing the face to full view. He is in the act of playing an ukulele and in his half parted lips there is life and suggestion. The whole painting is a strong piece of work, brimful of life and action. The hands dropped lightly over the strings of the adopted native musical instrument of these modern days, is one of the crowning features of the painting. In Hawaii, the ukulele is a musical instrument (and a nice looking koa job this one seems to be). The Reading Eagle of 4 October 1926 reported that Charles Mohawk, a Native American, was sentenced to 6 months in the workhouse on a charge of disorderly conduct. Apparently, he was alone and cold in New York — West End Avenue — so he crawled into the basement of an apartment house and made a fire, wrapped a blanket around his shoulders, and sang sad songs to the strumming of his ukulele. Tenants of the apartment building heard singing and saw smoke, so they called the police and hit the fire alarm. At the police station, it was learned that 42 year old Charles had worked in “Buffalo Bill” Codys’ show as a rider, and produced a photograph to prove it. After receiving his sentence, Charles was reported as saying that it was just as well, as his friends were gone, his brothers were gone, and so was Bill. He was all alone. I hope they let him keep his uke. The Norwalk Hour reported on 9 October 1925 that James A. Manning will have to practice his ukulele playing in jail. Apparently he was nicked for stealing an overcoat from the YD Club, Temple Street, New Haven. He says that he was drunk and a nice person at the club said he could wear it. John L Long said that he didn’t let Manning wear the coat, and it was John L. Long’s coat. Manning said that he was no thief and that he was just about to open a dance and ukulele school. The judge fined Manning $15 and sent him to jail for 15 days, telling that him could dance and practice his ukulele there. More people in gaol should dance and play uke, I think. The Gettysburg Times (5 August 1929) reported the fatal shooting of a ukulele player by former major league baseball player, Samuel (Red) Crane. Crane shot John D. Oren at Bria’s Hotel and Crane’s ex-girlfriend, Ms Della Lyter, as the two sat at a table in the Hotel. Oren was playing the ukulele at the time of the attack, and he tried to use the ukulele as a weapon of defence. He managed to hit Crane a couple of times before falling with two gunshot wounds in his abdomen. Crane then fled the scene, but three hours later he surrendered to police. He was bleeding from a head wound that the ukulele had left, so, after his arrest he was sent to hospital for treatment. Oren died hours after the shooting, and Ms Lyter died a few days later. Crane was found guilty of the second degree murder of both his victims. He served at least 15 years in prison. 1. No ukulele may be played between the hours of 6 pm and 6 am, nor between the hours of 6 am and 6 pm. 2. No crooning shall be allowed as accompaniment to ukulele playing. 3. The sound-producing parts of the ukulele, ie., the strings, shall not be constructed of gut, wire, thread, string, rope or any other article which might possibly produce sound. 4. The hazards of the ukulele industry shall be defined as the dangers which arise from bodily injury to the ukulele player, and therefore it shall be unlawful for persons between the ages of two years and one hundred and fifty years to play ukulele. 5. Tariff on the importation of ukuleles from foreign countries or United States possessions, including Hawaii, shall be one thousand dollars per instrument. The tax on domestic manufacture shall be one thousand dollars per instrument.